Pups. Dogs. Puppers. We love them, can’t get enough of them. They’re cute, make us feel good, they’re warm, sweet, adorable, and what could we ever do to return the favor? Feed them I guess, give them a warm place to sleep every night, and fill their entire lives with a warmth and friendship that they deserve. Those are all good, but have you considered also given the sweet little pets a little something called… the Puppuccino? One barista named Jodie Brooke, who goes by the handle @JodieBrooke2 on Twitter, did just that, chronicling the adorable sight of seeing a dog greedily lap up the cup of whip cream that makes up this sweet and overwhelming delight that the Puppuccino is so known for being? Look at this incredible video of a dog that, according to the Tweet, is named Max, and be stunned and amazed. Seeing Max grab the cup for himself and drag it back to his car is absolutely adorable! The dog knows what’s good, and he knows what he deserves. What did we do to deserve dogs, these ultimately super perfect animals! 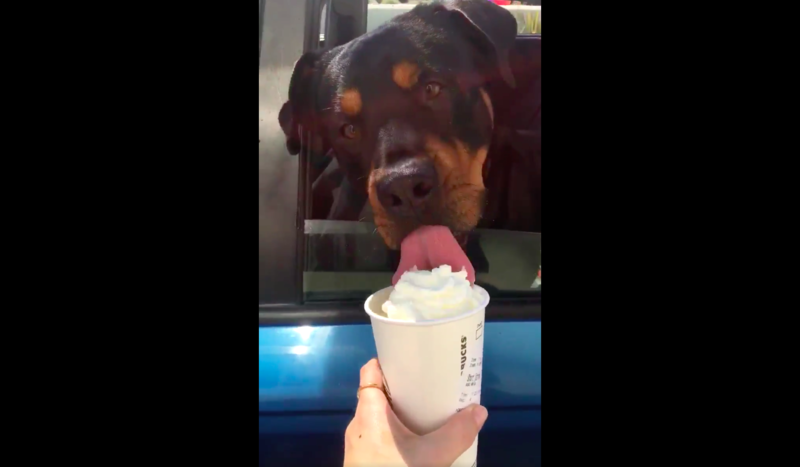 The people in the comments don’t know either, but they did follow Brooke’s example, and make a delicious creamy puppuccino for their own pups! If you ever wanted to see untold videos of dogs lapping up whip cream, of dogs stealing whip cream, and of dogs just feeling an affirmation from their owners in the form of delicious sweet treats, then I guess this entry has it all, doesn’t it? Don’t ever tell us we never did anything for you, okay? Check out the cute as all heck videos below. Look. We love it. Who wouldn’t? Some sick freak, that’s who. Makes me sick just thinking about this theoretical person!!! Want to see our video about a dog who face planted in some sand like a cute little goof? Well, don’t worry, we got that, you can watch it, we won’t judge, okay? Want more stories like these? Make sure to follow us on Twitter at @WhatsTrending.